ThemeForest By The Numbers: Thought The WordPress Theme Gold Rush Was Over? Think Again! Envato’s ThemeForest and CodeCanyon are de-facto the leading marketplaces for WordPress plugins and themes. 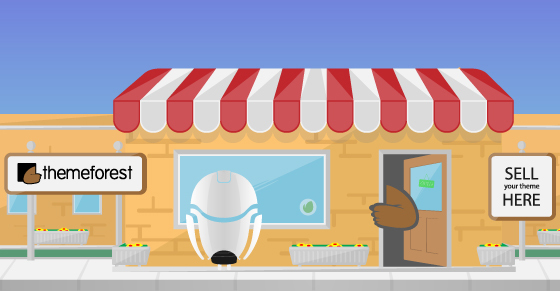 With a growing community of over 7 million subscribers, both marketplaces sound like a lucrative place to start selling your digital products. We’ve all heard of the amazing success stories of the Avada theme and the Visual Composer plugin. Those exceptional stories are what attracts developers to join the ship, but is it really possible to “make a living” from selling WordPress plugins/themes on CodeCanyon/ThemeForest? If so, what type of product will yield a better ROI – is it a WordPress plugin or a WordPress theme? Those are some of the questions this series of 3 posts will answer based on rock-solid unit economics and numbers analysis, pulled directly from Envato’s public API. This first post in the series will focus solo on ThemeForest. Envato was originally founded on 2006 by two designers from Sydney, Australia, who started a marketplace for Flash files named FlashDen. Moving 10 years forward, Envato owns 7 different marketplaces and about 7.7 million members worldwide. Last year alone it had reportedly made a pre-tax profit of $US 33 million from selling a wide range of digital goods starting from audio files and stock images to plugins and themes. ThemeForest was Envato’s 2nd marketplace launched in 2008, focused on selling templates and themes. The first item was listed on ThemeForest in August 2008. It was a WordPress theme named Our Community by a freelance developer from Malaysia – Kai Loon. ThemeForest today is Envato’s most successful marketplace in terms of income and is among the top 300 most visited websites in the world. Just How Big is The WordPress Portion within ThemeForest? From a total of 28,644 templates and themes on ThemeForest, 7,986 (or 28%) are WordPress themes. Since 2008, ThemeForest processed a total transactions worth of $355,617,997. Out of those transactions, $286,355,625 are exclusively for WordPress themes. Based on ThemeForest’s sales history and the average monthly sales per item, ThemeForest GVM (Gross Merchant Volume) on 2017 will be $175,660,082. WordPress themes sales will generate $138,600,378 of that pie. It’s a very simple equation, no room for mistakes. So if there’s no mistake in the equation, “new” money means either the average annual spend of Envato’s buyer on ThemeForest themes has to drastically increase, or the demand has to grow (number of buyers). Bingo! Envato nearly doubled its community members from 2015-2016. From a little over 4M members to almost 7.6M. The vast majority of the new members are buyers, and that’s where the money is coming from! So to answer the question – WordPress is THE most profitable platform for ThemeForest. 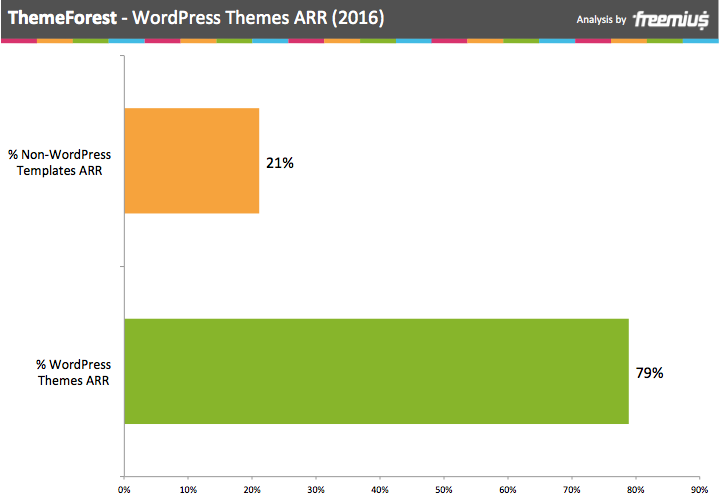 If WordPress was to vanish tomorrow, ThemeForest would lose ~80% of its revenues. How Popular is ThemeForest Among Developers? 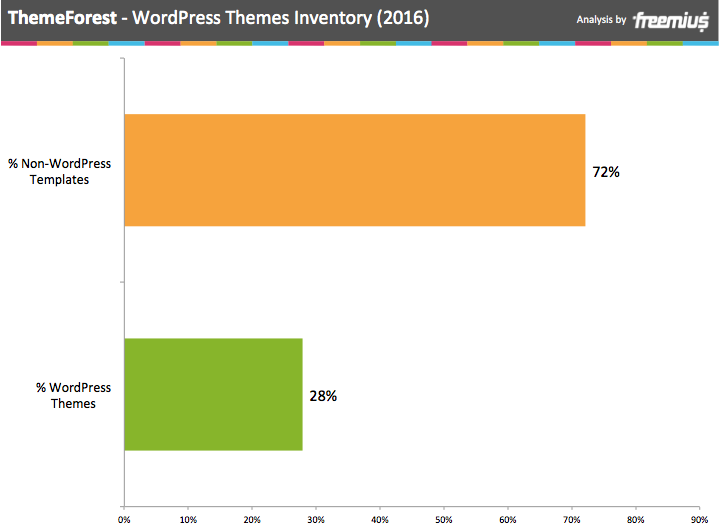 In terms of WordPress themes inventory, it’s clear that ThemeForest is only gaining more and more traction. I’ve heard many influencers in the WordPress ecosystem eulogizing the themes market. The numbers speak differently, though – not only is the “themes gold rush” not over, it’s only gaining more momentum. It’s interesting to see that it took ThemeForest around 3 years to start seeing its significant momentum. Also, it’s amazing to see that 2016 was a peak year for ThemeForest. 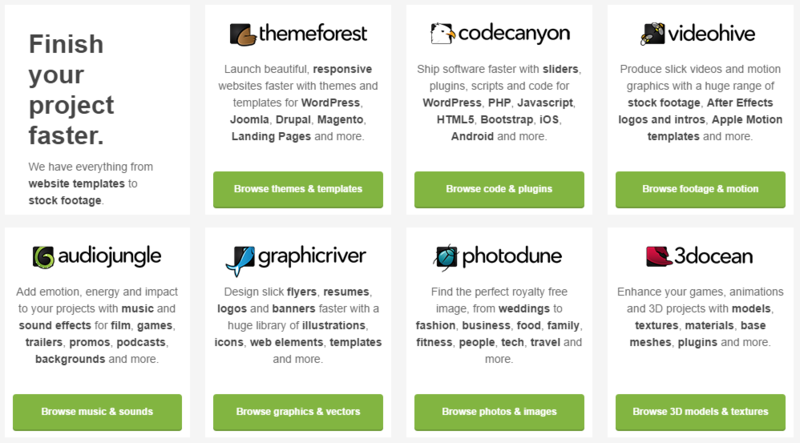 2,532 new WordPress themes were added to the marketplace. 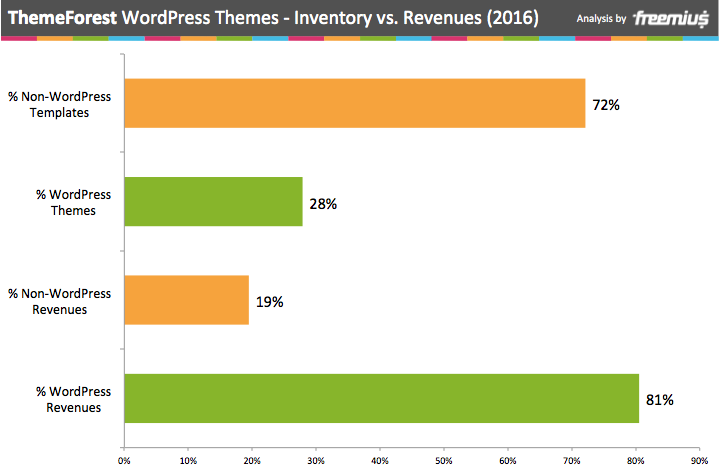 That’s a 46% growth in WordPress themes inventory in one year! Can You Build a Sustainable Themes Business on ThemeForest? This question might sound strange when you read it first since there are already a bunch of successful theme shops on ThemeForest, but we rarely hear about the failure stories, and it’s important to understand how many successes are there, compared with failures. It’s also important to realize that ThemeForest is already 8 years old, and that starting a WordPress theme business on ThemeForest today is very different than what it used to be 2 or 4 years ago. 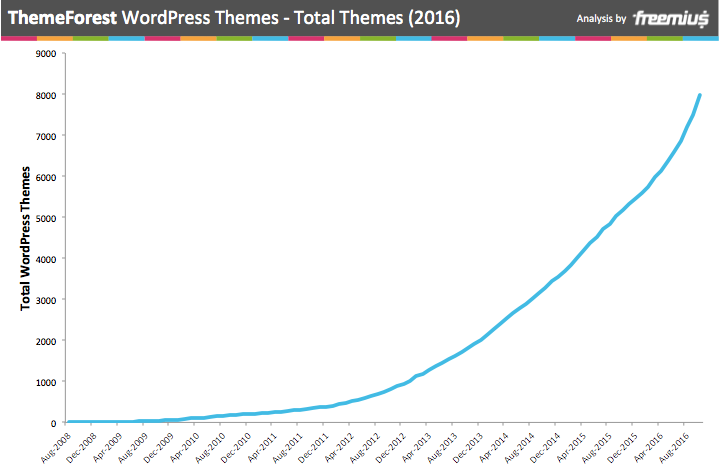 19 of the 8,000 WordPress themes crossed the $1M in total sales. Assuming Envato’s commission is 30%, ThemeForest turned 14 theme authors into millionaires. Avada is by far THE most successful WordPress theme on ThemeForest. It crossed the $16,000,000 in gross revenues, and the developers took home over $10,000,000 in earnings. Based on its sales history, the guys at Avada are collecting around $220,000 every month – that’s incredible! Just to understand the magnitude of the “whales”, the top 20 WordPress Themes are responsible for 13.5% ($18,756,450) of the total annual sales of WordPress Themes on ThemeForest. All of these numbers are mind blowing, but when we look at them through a magnifying glass, the numbers look very different for the rest of the authors. A great way to understand a marketplace is to analyze its prices distribution. The average price of a WordPress theme on ThemeForest is $50.63, while prices are ranging from $13 to $350 for the most expensive theme. 33% of the WordPress themes on ThemeForest are priced at $59 (the most popular price). 81.3% of the themes are priced at those 4 price points. The only explanation I could find to this pricing pattern is that until recently, the Envato personnel was responsible for pricing the themes. My guess is that they ran some analysis and found that those price points were generating the highest revenues (sales X price). How Many Licenses of Your WordPress Theme Should You Expect to Sell on ThemeForest? Based on the historical data – 36.56% of the WordPress themes on ThemeForest sold less than 100 licenses from the day they were released. The vast majority (6,940 / 86.9% themes) sold less than 1,000 licenses. Only 0.5% of the WordPress themes sold more than 10,000 licenses. And 3 of them sold more than 100,000 licenses. Then, I wanted to understand if spending more time in the marketplace necessarily means more sales, and how many. Therefore, I plotted the median sales per month over the total number of months the theme was listed in the marketplace. Not diving too deep on the definition of a median, but it’s a good way to show the “average” sales, while excluding the noise from the calculations by ignoring the exceptionally successful as well as themes with an exceptionally poor performance. It’s interesting to see a nice trend of a consistent linear growth during the first 70 months. Which means that you can expect a relatively consistent growth in total sales during the first 6 years. 76% of the WordPress Themes on ThemeForest earn below $1,000 per month, assuming the commission is only 30%. That’s 6,098 out of 7,986 themes. In fact, the numbers are even worse since the commission ranges from 30% to 70%. The average annual gross sales for a template or a theme on ThemeForest is only $6,132. 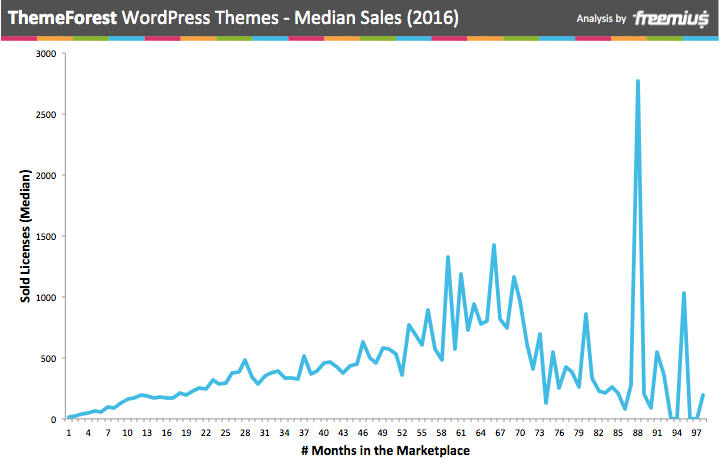 If we look at WordPress themes, the average annual sales is $17,355. That’s around $12,000 a year in earnings. Nice, but you may find it hard to sustain yourself with $1,000 while living in a western country. What is the Lifetime Value of An Average WordPress Theme on ThemeForest? 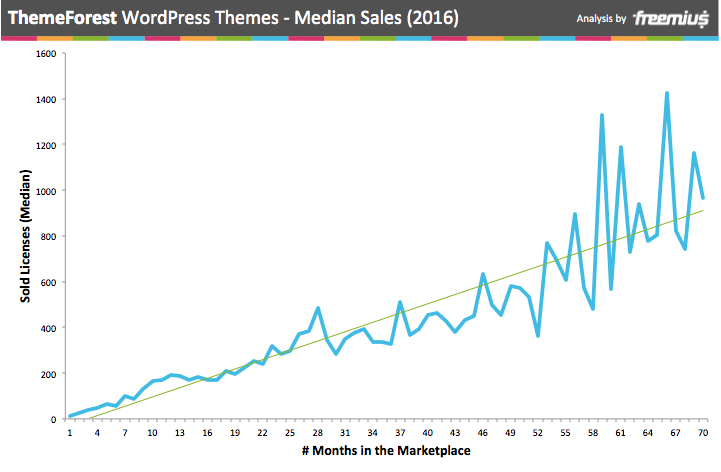 Based on the average annual WordPress theme sales and the chart of the median sales over time in the market, an average theme will generate $17,355 in annual gross during the initial 6 years. Based on the median chart, it looks like after 70 months the theme sales will start to slowly die, but since there were not enough data points after that period (only 215 themes), it’s really hard to predict that. If you don’t sell exclusively on ThemeForest, the commission is flat 64%. So after 10 years, you are expected to generate $62,407 net earnings (before taxes). If you do choose to sell exclusively on ThemeForest, the rev-share is gradual. The more you generate in total gross, the less commission you pay starting from 50% to 30%. In this case, after 10 years on ThemeForest you are expected to generate $113,598 net earnings (before taxes). Can ThemeForest Sustain The Same Amount of Revenues Per Theme? During the past year, an average of 230 new WordPress themes was listed on ThemeForest every month. 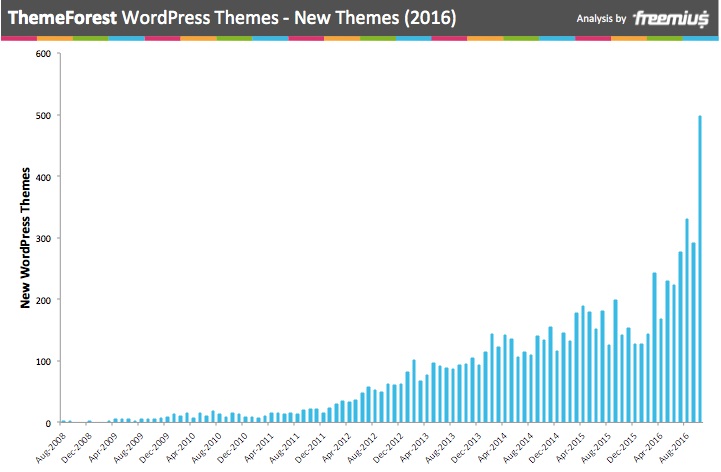 That’s an incredible growth of 34.5% of the WordPress themes inventory. This growth is great for the buyers because it means there are a larger variety and more competition, but it’s bad for the authors because the marketplace is becoming saturated. If Envato wants to sustain the same amount of sales per theme, either they will have to increase their buyers’ community by 34.5% while keeping the same conversion rates. Or, they would need to find a way to increase the annual spend of an average buyer by 34.5% (or any other combination in between). Based on Envato’s website, there are 7,627,950 community members. Assuming the average annual spend of a member on WordPress themes remains the same, Envato will have to acquire an additional 2,631,643 members to sustain the same revenues per theme. ThemeForest’s current average annual GMV is $138,600,378. 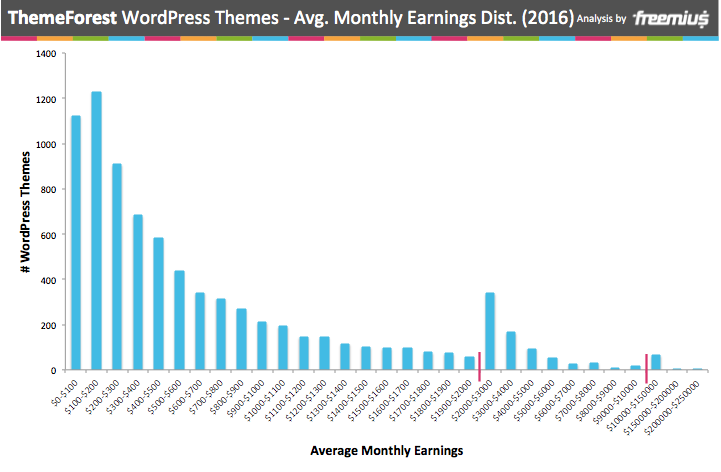 With current community size, it means that an average member in the database spends $18.17 a year on WordPress themes. The average price of a theme is around $50, which means that on average, every 3rd person on Envato purchases a WordPress theme every year – that’s insane! 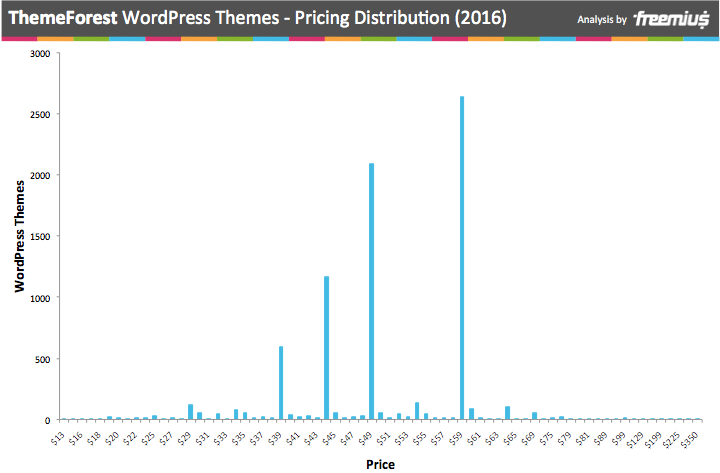 So theoretically, if all of the WordPress theme prices were to increase by 34.5%, that would be another way of sustaining the revenues. And maybe that’s one of the reasons why Envato decided to make the pricing more flexible for the authors. 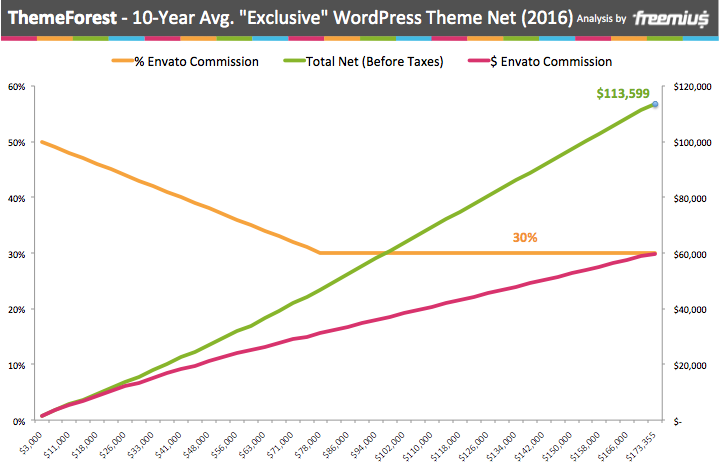 If the prices are not going to change, the average annual spend on WordPress themes will have to go up to $24.43, which means that on average, every 2nd person on Envato’s database will need to purchase a theme during 2017. Based on the historical data and the analysis laid out above, I would say that listing a new theme on ThemeForest today, would only make sense if you are living in a developing country where $500-$1,000 is enough to pay the monthly bills. The chances of starting a profitable theme business on ThemeForest while living in the U.S or any other western country and turning it into your main source of income are simply not in your favor. Only 5.6% of the themes are earning more than $3,000 / mo. And I didn’t even take the costs of theme development, design and continuous support, into consideration. If theme development was a one time investment where you develop a theme and forget about it, then as long as the cost of the theme development is below the $43,000 (which is definitely doable), you could generate a nice 10% annual interest rate investment for 10 years. Unfortunately, to sustain this stock called a “WordPress theme”, you are the one that will have to work hard keeping it relevant for the market and supporting your (hopefully) growing customers base. Is There A Better Way to Sell WordPress Themes? If you are just starting out with theme development, ThemeForest is a good place to test the waters and see if your WordPress theme gets any traction at all, without a lot of headaches. Plus, it’s a free code review done by experts 😉 (not that I’m encouraging anyone to exploit it). But, if you want to build a meaningful business, the odds to get there with ThemeForest are low. 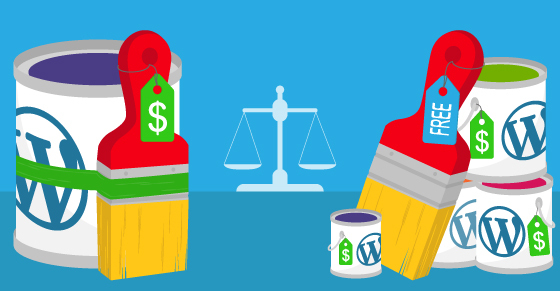 What Are The Main Benefits of Selling Your WordPress Theme Outside of ThemeForest? ThemeForest charges 30%-64% commission (starting with at least 50% for the initial $3,000) for distributing and marketing your WordPress themes. Some would say it’s way too much, but I think it’s a fair game considering that Envato provides you with access to a large community of potential buyers. Also, it makes sense that the initial commission is high since the onboarding of theme authors is more expensive than the ongoing costs (remember the code review part – that costs money for the company). Plus, when you are the monopoly of the market, you get to set the rules of the game. Now if you sell by yourself, you are obviously playing by your own rules and don’t need to pay a premium price for your theme sales. Even though you can now set up your own prices on ThemeForest, you are still competing with 8,000 other themes in the marketplace so it would be hard to charge $100 for an item where the average price point is $50. On the other hand, when a user gets to your site, it’s up to your marketing page to “convince” the user your theme worth the $100, you are not competing with other themes in the same category just a click of a button away. ThemeForest is currently limited to one time payments for lifetime updates. An average lifecycle of a website’s design is around 3 years. That’s money left on the table. When you sell by yourself, you can create a more sustainable business by setting up recurring payments and automatic renewals. So instead of getting paid once, you can drive recurring payments from the same customer for the same purchase. In return, you’ll provide continued support, and feature and security updates. If you sell your WordPress theme exclusively on ThemeForest, your distribution is up to the mercy of the marketplace economics. Any tiny change in the search algorithm, or changes in the SEO power of ThemeForest on Google, can and probably will affect your monthly sales. As an example, during 2015, a group of elite authors reported a significant drop by 70% in sales. That’s huge drop and not sustainable. Anyway, if you sell by yourself you can diversify your customer acquisition channels to lower the risk of such a sudden drop in sales. Different channels to take into consideration are SEO, social traffic, ads, email marketing, WordPress.org, non-exclusive marketplaces, etc. ThemeForest theme licenses are limited to a single site. Since themes are mainly purchased based on their layout and design, the chance that someone would buy the same theme twice is low. But, you can increase those odds by upselling multiple licenses with a substantial discount on the same transaction. This works – and works well! It increases the lifetime value of a customer. If you already have a free theme on WordPress.org, you can leverage your existing user-base with a service like Freemius Insights to start building a mailing list of people who use and appreciate your free themes and will be more likely to purchase your premium offering when you have one. Giving away themes on WordPress.org and upselling a premium version. A similar approach is riding the free distribution on WordPress.org with a free theme and upselling add-ons. By selling multiple add-ons, you can potentially increase your customer’s lifetime value from $100 to $500 and more. This will turn your theme into a platform with a micro-ecosystem for plugins. Just like Genesis and other successful theme shops did. Another business model that works well for some WordPress theme shops is memberships. You can develop a bunch of themes and sell access to all of your theme collection. This is a lucrative value proposition for agencies and freelancers that are constantly building websites and need access to a variety of templates. That’s how ElegantThemes and ThemeIsle built their businesses, and it’s booming. Ready To Build A Prosperous Subscription Based WordPress Theme Business? No shortcuts when you want to go big. You’ll have to build your brand, create a website and drive traffic to your sales pages. Luckily, you can avoid the from-scratch development of all the eCommerce infrastructure hassle involving things such as secure payments, subscriptions, licensing, automatic updates and more. 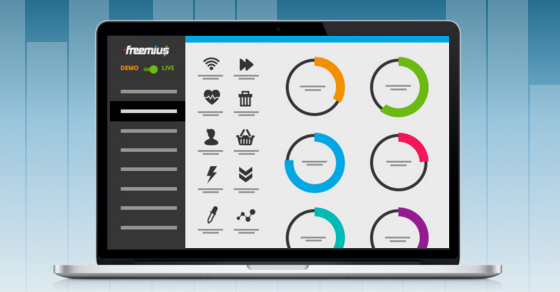 You can use a service like Freemius Checkout for WordPress plugin and theme developers, and start selling your theme in minutes from any website. All numbers are based on historical data pulled from Envato’s API. The data covers the numbers since ThemeForest’s initial launch to Nov 13, 2016. This gross revenues equation ignores extended support and extended licenses and uses static prices. Most of the earnings calculations are based on a flat 30% commission by the marketplace and are ignoring the additional 30% for non-U.S sellers from countries without a tax treaty with the U.S. Therefore, the earnings per item are actually lower on average because not all of the developers are selling exclusively on ThemeForest, and the commission is starting from 50% and goes down to 30% only after $74,000 of total gross sales. Not all the authors’ countries have tax treaty agreements with the U.S. Nonetheless; we believe that some of the early successful WordPress Theme authors on the marketplace got better terms to incentivize them to stay in the marketplace. Therefore, the 30% average commission is a pretty good indicator. There were 7 items listed on ThemeForest with crazy prices (some of them above a million dollars). We simply ignored those items on our calculations to avoid skewing the results. I think those theme authors were trying to run some SEO experiments and are gaming the marketplace to make their items appear first on search results when ordering the items based on the highest price first. Since I used very conservative heuristics for the revenues calculations, my gut feeling says that the true numbers are higher, but still in the same order. That was really really amazing insights, thanks a lot for sharing them! Thanks for taking the time to crunch the numbers, it’s insightful. I would say that listing a new theme on ThemeForest today, would only make sense if you are living in a developing country where $500-$1,000 is enough to pay the monthly bills. Is this assuming an author produces just one theme per year? Given that only 5.6% of individual themes make over 3k p/m, perhaps other theme authors are realising that to be sustainable, they have to treat themes as a volume based commodity. Instead of hoping to create one ‘hit’ theme like Avada or X, they instead create several with a similar code base (and plugins like visual composer), switch out the stock photos, then (re)submit them as ‘new’ themes to TF. Perhaps a driving factor behind the large increase in themes being submitted in 2016 is because TF authors increasingly realize that relying on one theme for their income is unlikely to work out too well. Interesting insight Gary! Indeed, those numbers are per average theme and might be one of the reasons for the substantial increase in inventory during the past year. Having said that, there’s overhead by every theme you add to the marketplace. Based on what I learned from TF authors, just throwing the theme in the wild doesn’t work anymore. If you want to make sells it requires some marketing efforts from the authors in addition to Envato’s marketing machine. There is a massive over head per theme. You can alleviate this with a framework but the time to go through the review system ( can be a lot of back and forth ) and although it might be assumed that if there are coding issues it’s bad coding this isn’t always the case. Themes that would pass on WP.org can be rejected on Themeforest because of different guidelines. Not only this but it can vary per reviewer too. So in my experience review time is a massive new theme cost. Then you have marketing costs, you need a really nicely designed item page. You also need to market outside Themeforest if you want continued sales. Then if you don’t want horrendous support costs you need to spend time on a knowledgebase and video’s. Thats a lot of overhead if you go for a quantity approach. Incredible research. I did a similar one last year for helping me with a personal decision of investing time on TF. Anywho loved the read! Keep it up folks! I had always wondered about theme forest developers. This is bookmark and share worthy for sure. Great job writing as well (not just the content but how you wrote). Thanks for the extensive analysis. Very informative. If you’re starting a business,want a give try with TF ? 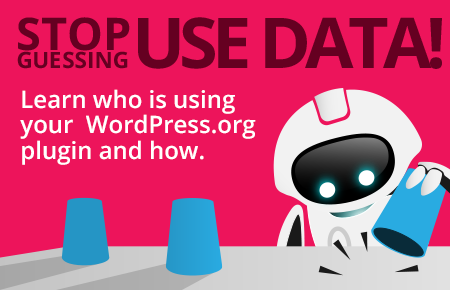 My recommendation would be to check last 10 pages of wordpress category first! Very interesting. You should write a similar post about codecanyon, the plugin business is growing and I wonder what insights you can find about it. This was the first post out of III, the next one is about CodeCanyon. as u mentioned its the 1st post out of 3 nd i hv red 2/3 thn where’s the last one. Great insights, thank you very much! Thank you very much for this research! Very informative article. thanks for the awesome and extensive analysis, these are some interesting numbers. When we started our WordPress theme business back in 2013 we thought as well to launch it on ThemeForest. While we were aware of the success stories of some ThemeForest authors at that time, we also quickly realized that being dependent on a 3rd party may not be the best business decision on the long run. So we eventually decided to drop the ThemeForest idea, especially after we noticed the lenghty and extensive onboarding process and the not so great payout ratio for non-exclusive authors. Instead we were focussing on our own website and heavily invested in marketing. Now, 3 years later we couldn’t be happier with that decision, especially when seeing that now more and more developers are leaving ThemeForest to focus on a sustainable and independent business model instead, which is a very wise decision in my opinion, especially if you are relying on the income. It may be the harder way to get yor business running, but if it works out, you’re in charge of your business without being dependent on decisions of a 3rd party – which can be the end of your business if you don’t like these decisions or if 3rd party decisions are ruining your business model. It also will be interesting to see how new theme authors will be doing in 1-2 years from now. While the market gets more and more saturated with themes, customers focussing on well established themes like Avada, Divi or else, there also is a new issue at ThemeForest that in my opinion can become quite a problem. Now that authors can set their own prices on ThemeForest, the competition isn’t anymore only about how good your WordPress theme is and how well you are at marketing your product on ThemeForest, but now there also is competition based on your country of residence. It’s noticeable that developers from low-wage countries release decent themes at a very low price, making it harder for developers from countries with higher costs to compete with that. Recently there even was an example where a developer launched a theme that was very similar to one of the best selling themes on ThemeForest, but only at a fraction of the cost. There’s definitely some great insights here. I’d say the big takeaway is to not put all your eggs in one basket. 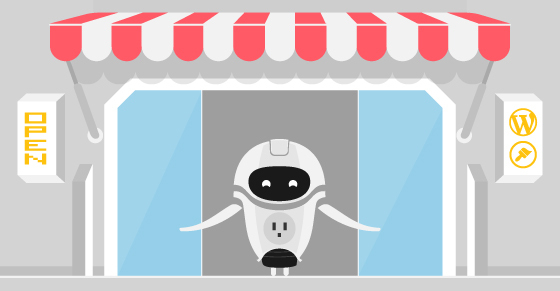 With a select percentage of themes getting the vast majority of the revenue, if you’re new to the game – you need to diversify your sales throughout multiple marketplaces (and probably your own site). There’s still money to be made, but it’s a lot tougher than it was three years ago – that’s for sure. Very interesting article. I started on ThemeForest in 2013 after switching from freelance, and first year was very tough, cuz I was doing only PSD templates and selling licenses to developers. But after one year of hard work I made many partnerships with developers. By the end of 2015 I was happy with ThemeForest earnings and was going to continue develop business there. But starting from 2016 I changed my mind, since they start to implement all these crazy changes and limitations for authors – taxes, slow review time, price wars and new competitive platform – Elements. Envato became a greedy money machine, period. And it’s a shame that they still use word “community”. Marketplace slowly dying day by day and it’s becoming more difficult for new and medium authors to survive there. so, I must agree that it’s much better to focus on own theme shop rather than Envato, don’t waste your time there. Just my point of view as an Envato author. Great article! Thank you for the detailed analysis and to everyone that shared their experience in the comments. I build and sell HTML templates on ThemeForest and also joined their affiliate program to increase my overall revenue. Hopefully by the time I’m prepared to submit WordPress themes the market won’t be completely saturated. Happy New Year to everyone! Love this article nice info. Thanks!!! And now? 2 years later… what happened? I noticed: It is the usual marketplace mistake all people make. They believe they need to support ThemeForest or Amazon or any marketplace, but in truth, you just add their % on top. TF wants 70%? Ok, that tells me ThemeForest buyers pay up to 70% to much. (I feel stupid buying there). The biggest mistake is to use an exclusive 1 marketplace. Your driving traffic to a page that tries to redirect users to themes from other authors. Your commission of 30% will be used to promote the category (the top sellers with other words), but not for your product. So you are in fact sponsoring TF and the top sellers putting a 50$ theme inside. Tf wants 70%? Increase your price by 70% just for TF clients. That’s very easy… the review time of 1 month is already worth to move away. WordPress.org is useless for my themes too, I make WooCommerce shop themes. Removing emojis (core plugin) is not allowed lol… while TF now wants you to include 700 plugins and fill the database with static 1-time settings. Both are bad finally. In my eyes, there isn’t any good solution out there atm, compared to other industries.